The end cometh. Don’t take my word for it – the Avengers: Infinity War synopsis is all too happy to hammer home the fact that someone is going to die. Plus, y’know, there’s the whole end of the universe thing that they’re hinting at. No big deal. It’s time to start practicing your ugly crying faces. 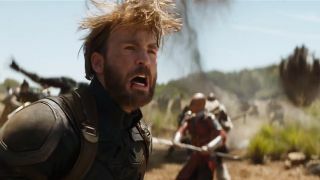 An Avenger is almost certainly biting the dust in Infinity War. The synopsis practically laughs in your face, licking its lips over every terrible tragedy that it’s teasing. "An unprecedented cinematic journey ten years in the making and spanning the entire Marvel Cinematic Universe, Marvel Studios’ Avengers: Infinity War brings to the screen the ultimate, deadliest showdown of all time. The Avengers and their super hero allies must willing to sacrifice it all in an attempt to defeat the power of Thanos before his blitz of devastation and ruin puts an end to the universe." That whole ‘deadliest showdown of all time’ is worrying enough but that’s small potatoes compared to Thanos attempting to end everything. The joke’s on him, Marvel have at least a billion movies set after this. Someone should’ve checked our MCU movie schedule. The million-dollar question, however, is how far will the Avengers go to stop Thanos? Sacrifice isn’t a word you throw around willy-nilly. Someone’s going to go above and beyond to stop the Mad Titan, and pay for it with their lives. I, for one, am not ready for this. We’ll find out on May 4 whether Marvel is just calling our bluff or whether it’s being deadly serious. Feeling a bit behind when it comes to all things MCU? Or just want to relive the Marvel magic? In preparation for Infinity War, be sure to join in with our weekly watch as we go through every single Marvel movie before the third Avengers movie arrives.